This exhibition of works by the Romanian artist Marius Bercea (b. 1979), all dating from 2013, brings an explosion of neon brights to Blain|Southern’s galleries on Hanover Square. The result of a road trip from his Transylvanian hometown Cluj-Napoca to Los Angeles, his dreamscape canvases meld the flotsam of Americana with traditional Romanian cultural motifs, the rural with the urban, and thick daubs of impasto oil with light washes of neon. At the age of 10, Bercea was witness to the 1989 Romanian Revolution, and the collapse of the USSR. This historical moment, and the subsequent dissolution of divisions between east and west, is explored in these works. The rural landscape of post-Soviet Transylvania, where Bercea grew up, collides with the neon-fronted buildings of free market California. 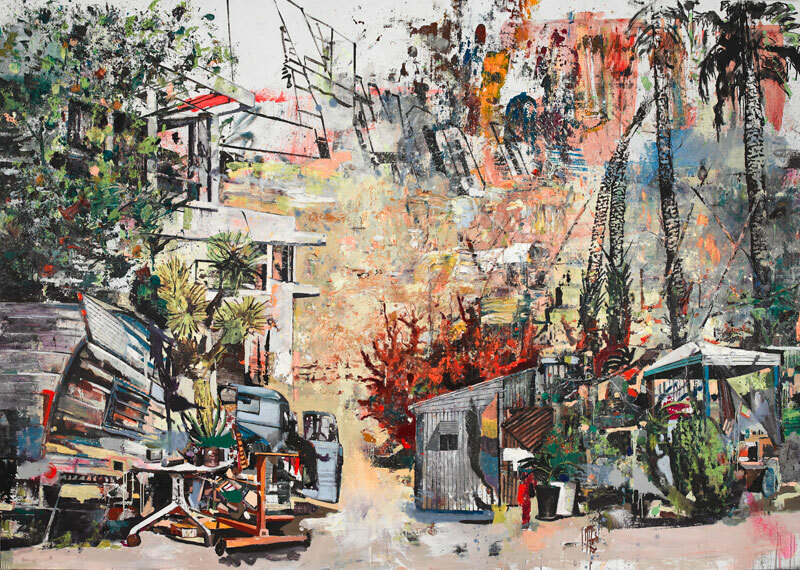 In Seasonal Capital of Itinerant Crowds (2013), the largest painting in the exhibition, the foreground is sketchily rendered with impermanent structures, caravans, and cluttered items of everyday life recalling itinerant communities he encountered while travelling in the desert. On the right, bleached-out palm trees blur into a pink and blue sky. Framing these to the left is a large, modernist architectural block that characterised many 20th-century European cities. This ubiquitous architecture melds into the Hollywood sign depicted across the top of the canvas: a historical and pictorial joining of cultural iconography. In the next room, Spies of the Angels (2013) is a kaleidoscope of luminous colours pulled down across the back of the canvas: pink, blue, yellow, orange – reminiscent of bright neon signs flashing over an American cityscape. 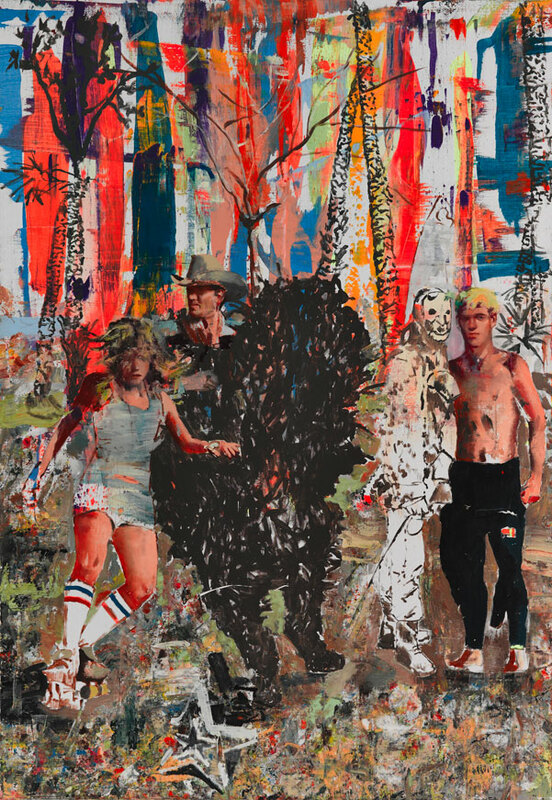 Over this are sketched a patchwork of palm trees and archetypal American figures: the Marlboro cowboy, a skater girl and a surfer boy filled out in peachy skin tones, and at their feet, a star. Accompanying them are two spectres, or ‘zombies’, as Bercea refers to them. A large, bear-like creature fills the centre of the canvas and a ghostly figure stands next to the surfer. Surrealism meets realism, the incomprehensible with sun drenched Americanisms. Suspended Animation (2013) depicts a dark Transylvanian landscape punctuated by sketched architectural forms. Juxtaposed with this is a star-studded Californian sky. Yellow paint is spattered across the sky to represent the stars, perhaps a reference to the quintessential American Abstract Expressionist, Jackson Pollock. Bercea doesn’t hide the fact that he paints: he revels in it. He pulls, drips, scrapes and splodges it across his canvases. Bristling with energy and excitement, his dystopian, often downright surreal landscapes are strikingly original. 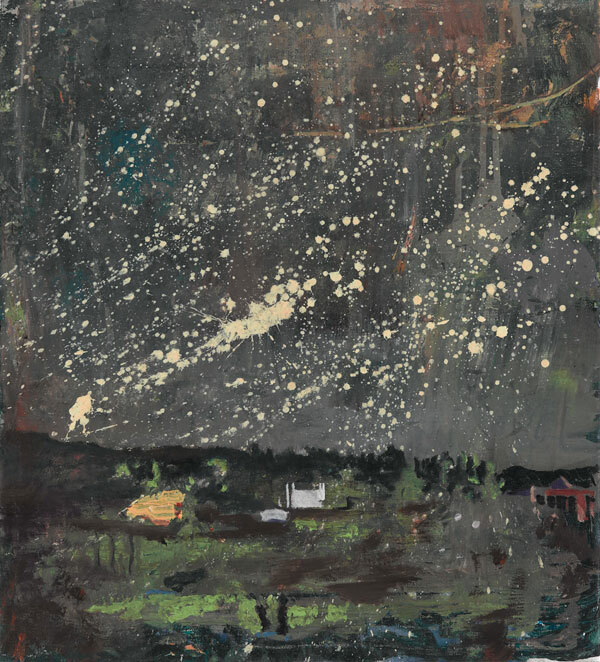 ‘Marius Bercea: Hypernova’ is at Blain|Southern, London until 17 April 2014. Post-Soviet Transylvania? Last I knew, Romania never was part of the Soviet Union.